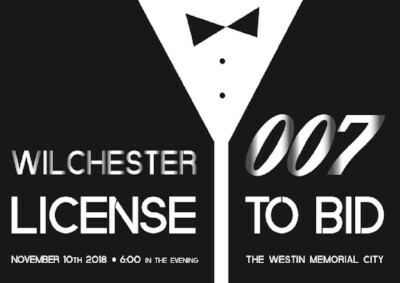 Her Majesty’s Secret Service invites you to spend an evening raising funds for our beloved Wilchester Elementary School, while sharing a martini, shaken, not stirred, with other secret agents and mystery women. Join us November 10th at 6:00 pm at The Westin Houston, Memorial City. License to Bid includes dinner, silent auction, big board, live auction, raffle items, games, late night food and entertainment. Tickets on sale online at https://501auctions.com/wce007. Bond together for a great cause! License to Bid General Admission tickets are $100 per person and include dinner, silent auction, big board, live auction, raffle items, games, late night food and entertainment. Tables seat 10 and you can request your tablemates when purchasing tickets or can request to be seated with other guests from your grade level. You will need to register with 501 Auctions before you can purchase tickets! This registration will allow you to purchase raffle tickets, as well as tickets for the wine pull, grab bags, and the heads or tails game. All are available for purchase today! When purchasing tickets, you may choose to cover the credit card fees associated with your purchase that would be charged to the PTA.